Tantor Media - Could It Be B12? 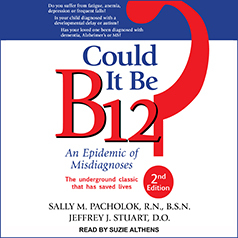 Could it Be B12?, written for both the patient and the interested layperson, outlines how physicians frequently misdiagnose B12 deficiency as Alzheimer's disease, multiple sclerosis, heart disease, neurodevelopmental disorder, Parkinson's disease, depression, or other mental illnesses. Presenting a wide scope of problems caused by B12 deficiency, this comprehensive guide provides up-to-date medical information about symptoms, testing, diagnosis, and treatment. Could it Be B12?, written for both the patient and the interested layperson, outlines how physicians frequently misdiagnose B12 deficiency as Alzheimer's disease, multiple sclerosis, heart disease, neurodevelopmental disorder, Parkinson's disease, depression, or other mental illnesses. Now in the second edition, this resource has been thoroughly updated with the latest research, diagnostic tests, treatment options, case studies, and testimonials.